K92 Mining Inc. ("K92" or "KNT" or the "Company") (TSX VENTURE:KNT) is pleased to announce that it has entered into an agreement with Clarus Securities Inc. as lead agent on behalf of a syndicate of agents (collectively, the "Agents"), whereby the Agents will raise up to C$16,000,000 (the "Offering") through an Offering of up to 20,000,000 units of the Company (the "Units") to be priced at C$0.80 per Unit. Each Unit is comprised of one common share in the capital of the Company ("Common Share") and one Common Share purchase warrant ("Warrant"), with each Warrant entitling the holder to purchase one Common Share at an exercise price of $1.05 for 12 months following the completion of the Offering. The proceeds raised from the Offering will be used by the Company for exploration and development of the Company's mineral properties and for general corporate purposes. The Offering is scheduled to close on or about June 21, 2017, and is subject to certain conditions including, but not limited to, the receipt of all necessary approvals of the TSX Venture Exchange. The securities to be issued under this Offering will be offered by way of private placement exemptions in all the provinces of Canada. The Units to be issued under this Offering will also be offered offshore, including in the United Kingdom pursuant to applicable exemptions and in the United States on a private placement basis pursuant to exemptions from the registration requirements of the United States Securities Act of 1933, as amended. The securities referred to in this news release have not been, nor will they be, registered under the United States Securities Act of 1933, as amended, and may not be offered or sold within the United States or to, or for the account or benefit of, U.S. persons absent U.S. registration or an applicable exemption from the U.S. registration requirements. This release does not constitute an offer for sale of, nor a solicitation for offers to buy, any securities in the United States. Any public offering of securities in the United States must be made by means of a prospectus containing detailed information about the issuer and its management, as well as financial statements. K92 Mining Inc. is focused on advancing the Kainantu Gold Mine, located in the Eastern Highlands province of Papua New Guinea. The Kainantu property covers a total area of approx. 410 km2 and was previously mined by Highlands Pacific and Barrick Gold from 2006-2009. 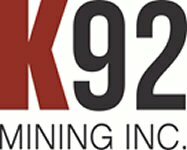 K92 Mining Inc. was purpose built for the acquisition of the Kainantu Gold Mine. In addition to targeting a move towards production, K92 will focus on ‎both expanding known areas of mineralization and drilling high priority exploration targets. K92 is led by an experienced team of industry professionals with substantial international expertise in mining, production start-ups, production re-starts, mineral exploration, and finance.